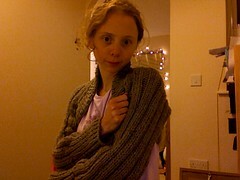 This is the first thing I've finished in a while, partly because it's taken me a long time to knit. It's looooooooooooong. It took up a whole 500g skein of aran. Now I'm trying to make an angel for my great aunt for next Thursday. Wish me luck.